I spent most of the day mired in dark thoughts struggling against a headwind and the goal of trying to make over 120 miles while only pedaling 12 miles per hour. Unfortunately, not much about that sentence is unusual for me. I seem to continually put myself in difficult situations that force me to question my life's ambition and role in the world. A fairly accurate assessment of my feelings would be either, one, I feel completely overwhelmed and I don't think doing adventures is a viable career choice; or two, this is awesome. Probably more 'one' than 'two' and rarely in between. Before I left, I told Maria that I go through this same mental process EVERYTIME I'm on an expedition. To which she commented matter-of-factly, 'well if you know then you can avoid it.' To which I agreed, except I realize now, I can't avoid it. It's a process that I have to go through: days (or weeks) of struggle for a single grain of positivity. I had a rough goal of trying to bike to Riveredge from Wisconsin Rapids today - 125 miles. I thought if I got close, I could always camp and finish the rest of the bike leg of the WisconsATHON on Monday. I would just see how the day played out. For starters, the wind shifted to the South which meant a headwind as I pedaled toward Newburg - not the hurricane force winds of yesterday but one that was definitely blowing in my face. It was a struggle, but the roads were smooth and the sun felt warm (at times) on my face. I tried to focus on small goals - to which road biking in Wisconsin is perfectly suited - every 10 or 15 miles there was a small town or settlement. In between beautiful hardwood forests and expansive farm fields. Because, I am traveling back roads, most of the towns are smaller than 2,000 people, many much smaller still. It seemed like on every Main Street beautiful old buildings were empty and falling apart. Farm houses and barns as well. In one town, the biggest and newest (by a long stretch) building was the funeral home - a morbid observation, I know, but an accurate one. 'This is the quiet part of Wisconsin,' one woman commented when I mentioned I was from north of Milwaukee originally. I got to Fond du Lac a little before sunset and with still 36 miles to go. 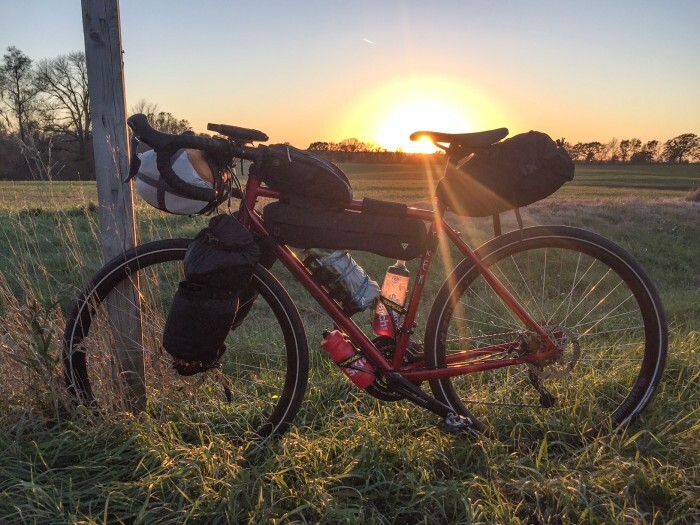 I decided to keep riding and hope that the setting sun would diminish the winds, which it did. I put on my bike lights and headlight and watched a huge orange ball set while I nearly full moon rise - in the middle, me and bike, the fulcrum of a celestial balancing act that has gone on since time began. At exactly the same time I felt like biking on a bumpy and cracked country road was becoming dangerous at best, I crossed a gravel 'rails to trails' bike trail (Eisenbahn State Trail). Checking the map, it ran right into West Bend and for the next 20 miles I pedaled effortlessly down the narrow path. Eventually, I reached Newburg and the west entrance of Riveredge. As I pedaled to the main building, I though of my dad who spent 40 years as Director of Riveredge driving back and forth on this same road. He died last year and I couldn't help but smile knowing I was experiencing what he had nearly every day of his adult life. For those of you interested in giving the gift of adventure to today's youth, please support my effort to raise $5000 for Riveredge Nature Center's summer camps. Donate here and check out the great 'thank you' swag as well.